A bold new remedy for the sprawling and wasteful health care industry. Where else but the doctor’s office do you have to fill out a form on a clipboard? Have you noticed that hospital bills are almost unintelligible, except for the absurdly high dollar amount? Why is it that technology in other industries drives prices down, but in health care it’s the reverse? And why, in health care, is the customer so often treated as a mere bystander—and an ignorant one at that? The same American medical establishment that saves lives and performs wondrous miracles is also a $2.7 trillion industry in deep dysfunction. And now, with the Affordable Care Act (Obamacare), it is called on to extend full benefits to tens of millions of newly insured. You might think that this would leave us with a bleak choice— either to devote more of our national budget to health care or to make do with less of it. But there’s another path. 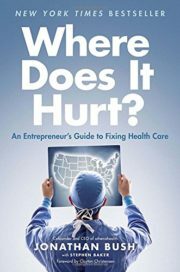 In this provocative book, Jonathan Bush, cofounder and CEO of athenahealth, calls for a revolution in health care to give customers more choices, freedom, power, and information, and at far lower prices. With humor and a tell-it-likeit- is style, he picks up insights and ideas from his days as an ambulance driver in New Orleans, an army medic, and an entrepreneur launching a birthing start-up in San Diego. In struggling to save that dying business, Bush’s team created a software program that eventually became athenahealth, a cloud-based services company that handles electronic medical records, billing, and patient communications for more than fifty thousand medical providers nationwide. Bush calls for disruption of the status quo through new business models, new payment models, and new technologies that give patients more control of their care and enhance the physicianpatient experience. He shows how this is already happening. From birthing centers in Florida to urgent care centers in West Virginia, upstarts are disrupting health care by focusing on efficiency, innovation, and customer service. Bush offers a vision and plan for change while bringing a breakthrough perspective to the debates surrounding Obamacare. • Well-intended government regulations prop up overpriced incumbents and slow the pace of innovation. 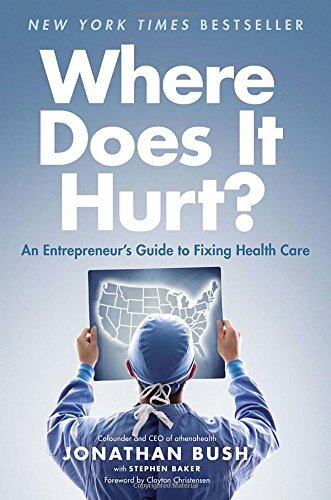 • Focused, profit-driven disrupters are chipping away at the dominance of hospitals by offering routine procedures at lower cost. • Scrappy digital start-ups are equipping providers and patients with new apps and technologies to access medical data and take control of care. • Making informed choices about the care we receive and pay for will enable a more humane and satisfying health care system to emerge. Bush’s plan calls for Americans not only to demand more from providers but also to accept more responsibility for our health, to weigh risks and make hard choices—in short, to take back control of an industry that is central to our lives and our economy.